A dental implant is a pure titanium post that is inserted into the jawbone to function as an artificial replacement root for a missing or broken-down tooth. A dental crown, bridge or denture is then mounted onto the implant, replacing the missing or extracted tooth or teeth. Dr. Schmidt and Dr. Lee recommend dental implants as the best choice for tooth replacement. Dental implants are the strongest, longest-lasting and most lifelike tooth replacement option. The jawbone around the inserted implant integrates (fuses) with the implant surface and anchors the implant securely in place. The integrated implant is just as strong as a natural, healthy tooth root and forms a solid foundation for a dental restoration (crown, bridge or denture). A connecting piece known as an abutment is placed on top of the implant. The top of the abutment rests above the gumline and acts as the attachment point for a new replacement tooth or teeth. Implant-supported replacement teeth have many distinct advantages and benefits that make them superior to any other form of tooth replacement. Learn more about the advantages and benefits of dental implants. 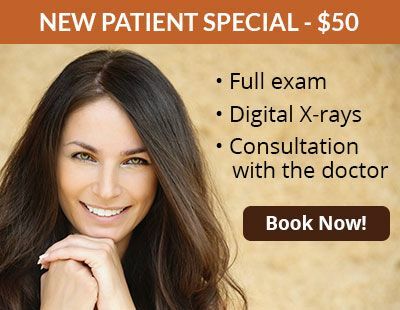 You will receive X-rays with your consultation to ensure the best possible treatment plan. 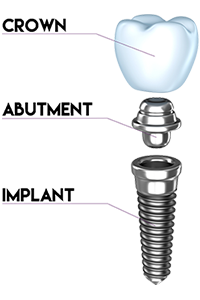 Due to advances in technology over the last twenty years, most patients can now successfully receive dental implants. 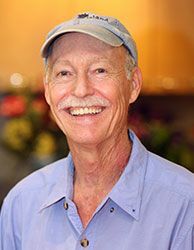 In the past, patients who had too much bone loss around their teeth were ineligible to receive implants, but thanks to modern bone grafting techniques our doctors can usually restore adequate bone support to securely anchor the implant. In many cases they can eliminate the need for bone regeneration altogether. Patients with health problems that made implant placement too risky in the past can now receive dental implants. This includes patients with cardiovascular disease, diabetes or who are heavy smokers. Age is not a factor in receiving dental implants. The only exceptions are young patients whose jaws have not yet fully developed. 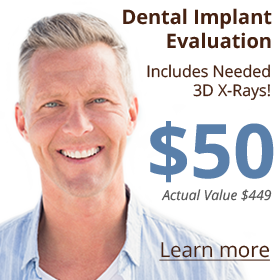 The doctor will assess your medical and oral conditions carefully to determine if you are a candidate for dental implants, and what measures might be needed to ensure successful treatment. 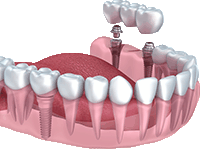 Dental implants can support an individual dental crown, a dental bridge of any size, or a full-arch denture. After a thorough assessment of the bone volume and density in your jaw, the doctor will determine how many implants will be needed for a bridge or denture. For bridges and dentures, a small number of implants can be used to support many replacement teeth at once. Our doctors can provide dental implants to replace a single missing tooth, several teeth or an entire arch of missing teeth. The doctors are highly trained and experienced in implant placement, and use advanced technology to make your treatment minimally invasive, efficient and comfortable. 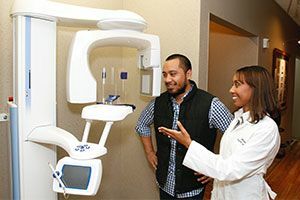 Our doctors also design and place the top-quality new replacement teeth that the implants will support, making Atlanta Dental Center a start-to-finish solution for almost any patient’s implant and replacement teeth needs. Learn more about our Dental Implant Services here.